Steve Harvey has always known a great looking suit when he see it and this shiny gray plaid 3 piece Steve Harvey suit is just the kind of suit that Steve Harvey loves to wear. Featuring a 2 button single breasted style jacket with matching vest and single pleat pants. 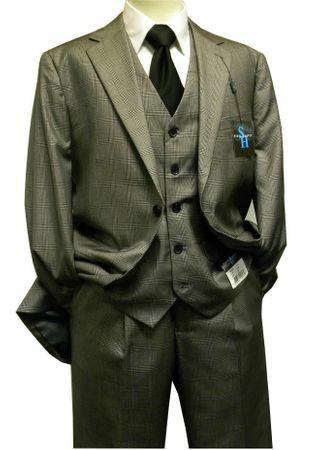 This gray plaid 3 piece Steve Harvey suit won't stay in stock long. Made of Poly/Rayon super 150s fabric that is perfect for most weather. You will appreciate how stylish you look wearing this refined looking gray plaid 3 piece Steve Harvey suit from Contempo.